Frankie Newton was a much-admired trumpeter whose recording career spanned two highly significant decades from the 1920s through to the 1940s during which time his adaptable, mellow swinging style made him a popular sideman in many different leaders’ bands while he also led his own orchestras and small bands in sessions that produced some marvellously entertaining recordings. The fact that he somewhat lost interest in music in favour of other interests, resulting in him fading from the scene as bebop developed, meant that his influence and legacy has been sadly ignored over the years. 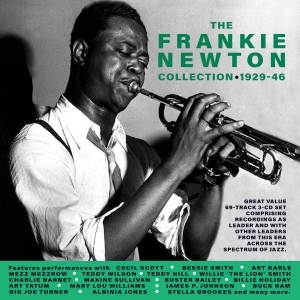 This great-value 69-track 3-CD set comprises recordings from across his active career, and features recordings with a startling variety of top names, ranging from Bessie Smith in the 1920s, through the likes of Mezz Mezzrow, Teddy Wilson Willie “The Lion” Smith, Maxine Sullivan and Billie Holiday in the ‘30s, to Art Tatum, Mary Lou Williams, and Big Joe Turner in the ‘40s, as well as his own bands such as the Uptown Serenaders and Café Society Orchestra. It encompasses a highly entertaining range of jazz styles, showcasing him in a variety of different musical environments, both in the studio and ‘live’, as a powerful and inventive soloist and sensitive accompanist and ensemble player as well as a leader. It provides a substantial tribute to a musician who merits much more attention than he had generally received.